Home prepared baked beans: In this food there are some nutrients that are found in low quantity, for example total sugars, vitamin c and riboflavin. Carob flour: This food has a low quantiti of water, total lipid and sodium but has a high quantity of carbohydrate, total dietary fiber and total sugars. Canned chili with beans: This food has a low quantiti of total sugars, manganese and selenium but has a high quantity of pantothenic acid. Raw lentils: Raw lentils is high protein, carbohydrate and total dietary fiber. On the other hand. is low in water, total lipid and total sugars. Raw lupins: High in protein, magnesium and phosphorus and low in water, total dietary fiber and total sugars. Raw peanuts: This food has a low quantiti of water, sodium and vitamin c but has a high quantity of food energy, protein and total lipid. Raw spanish peanuts: This food has a low quantiti of water, total sugars and sodium but has a high quantity of food energy, protein and total lipid. 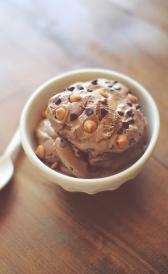 Raw valencia peanuts: Raw valencia peanuts is high food energy, protein and total lipid. On the other hand. is low in water, total sugars and sodium. Raw virginia peanuts: This food has a low quantiti of water, sodium and vitamin c but has a high quantity of food energy, protein and total lipid. Defatted peanut flour: This food has a low quantiti of water, total lipid and vitamin c but has a high quantity of protein, ash and total dietary fiber. Low fat peanut flour: High in food energy, protein and total lipid and low in water, total sugars and sodium. Meatless bacon: High in total lipid, ash and sodium and low in total sugars, vitamin c and pantothenic acid. Meat extender: This food is low in water, total sugars and sodium but Meat extender has protein, ash and total dietary fiber in high quantity. Meatless sausage: This food has a low quantiti of total sugars, vitamin c and folic acid but has a high quantity of sodium, thiamin and niacin. 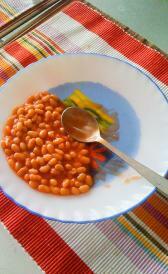 Raw soybeans: High in food energy, protein and ash and low in water, sodium and folic acid. Miso: High in ash and sodium and low in vitamin c, folic acid and vitamin b12. Natto: Natto is high calcium, iron and magnesium. On the other hand. is low in sodium, niacin and folate, total. Tempeh: This food is low in total dietary fiber, total sugars and sodium but Tempeh has copper in high quantity. Raw full-fat soy flour: This food has a low quantiti of water, sodium and vitamin c but has a high quantity of food energy, protein and ash. 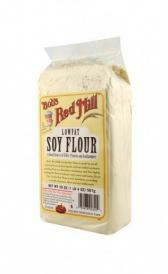 Defatted soy flour: Defatted soy flour is high protein, ash and total dietary fiber. On the other hand. is low in water, total lipid and sodium. Low-fat soy flour: This food is low in water, sodium and vitamin c but Low-fat soy flour has protein, ash and total dietary fiber in high quantity. Raw defatted soy meal: This food has a low quantiti of water, total dietary fiber and total sugars but has a high quantity of protein, ash and calcium. Soy protein isolate: This food is low in water, total sugars and selenium but Soy protein isolate has protein, iron and phosphorus in high quantity. Fried tofu: Fried tofu is high calcium, manganese and selenium. On the other hand. is low in sodium, vitamin c and riboflavin. Okara: Okara is low in total lipid, total dietary fiber and total sugars. Home prepared hummus: In this food there are some nutrients that are found in low quantity, for example total sugars, selenium and riboflavin. Home-prepared falafel: This food is low in total dietary fiber, total sugars and selenium but Home-prepared falafel has folate, total, food folate and folate in high quantity. Raw pink lentils: High in protein, carbohydrate and total dietary fiber and low in total lipid, total sugars and sodium. Chickpea flour (besan): Chickpea flour (besan) is high protein, carbohydrate and total dietary fiber. On the other hand. is low in water, sodium and vitamin c.
Commercial hummus: This food is low in total sugars, selenium and vitamin c but Commercial hummus has copper and food folate in high quantity.